Psychology involves the scientific study of behaviour and experience, including thinking, feeling and action. 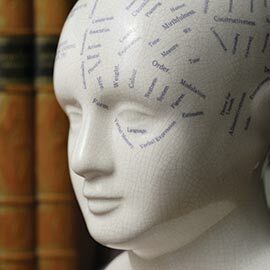 Psychology teaches us, among other topics, how we learn languages, how we function in community, and how to promote healthy development across the lifespan. The Bachelor of Arts (BA) in Psychology program at our Waterloo campus, you'll learn about the roles that genetics, personality, social factors, external environments, cultural differences and societal context have in influencing these behaviours and processes. Psychology students participate in Community Service-Learning (CSL), a mandatory component of developmental and some other psychology courses. CSL will place you into a daycare facility, school, or service organization within the Waterloo community – a great way for you to get real-world experience. In your upper years, you’ll have the opportunity to become involved in the cutting-edge research of our professors. Our professors are not only accomplished researchers with international reputations, but also among the best teachers you’ll find anywhere (many have won teaching awards), who are excited to give you the education you need to pursue your goals. Minimum admission range of mid 70s. Competitive admission range of mid 80s. One of 3M Functions, 3U Functions & Relations or any 4U mathematics at 60%. English calculated in admission average. HL or SL Mathematics at 3.